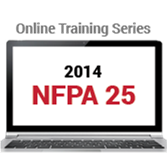 Two important self-guided online training courses introduce the 2014 NFPA 25: Inspection, Testing, and Maintenance of Water-Based Fire Protection Systems. Based on the 2014 edition of NFPA 25, this self-guided online training series covers the Standard's scope and how requirements are used to ensure water-based fire protection system readiness, conduct system testing, and address impairments. Go online to learn essential basics on ITM for water-based fire protection with An Introduction to NFPA 25. Based on the 2014 NFPA 25: Inspection, Testing, and Maintenance of Water-Based Fire Protection Systems, this self-paced online training course introduces NFPA 25 to the user. It covers the scope and purpose of the Standard along with the definitions for many of the terms used in the Standard. The course explains the role and responsibilities of the property owner -- including providing access, correcting deficiencies, record keeping, and freeze protection. Impairment procedures are discussed as well as the requirements for ensuring that system piping is free from obstructions. NFPA®'s self-guided online training course Using NFPA 25 to Inspect, Test, and Maintain Sprinkler Systems outlines a path to successful compliance. Sprinkler systems are the most common water-based fire protection systems. Based on the 2014 NFPA 25: Inspection, Testing, and Maintenance of Water-Based Fire Protection Systems, this self-paced online training course explains how to locate and apply the requirements for the inspection, testing, and maintenance of sprinkler systems. It covers the major types of sprinkler systems including wet pipe, dry pipe, deluge, and preaction systems.